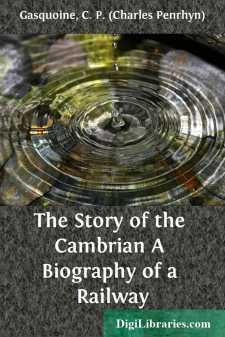 Responsibility for its acceptance, however, and for the execution of the task, with its manifold imperfections and shortcomings, rests entirely with the author, whose only qualification for assuming the rôle of biographer of the Cambrian is the deep interest he has always taken in a subject worthy of a far abler pen. Not even the attempt would have been possible had it not been for the valuable assistance readily given by many kind friends directly or indirectly associated with the Cambrian Railways. Special thanks are due, and hereby gratefully acknowledged, to Mr. Samuel Williamson General Manager, not for only much personal trouble taken in supplying information and looking through proof-sheets, but for placing no small portion of the time of some members of his clerical staff at the disposal of the author, who has troubled them on many occasions, but never without receiving prompt and patient response; to other officials and employees, past and present, of the Company for information regarding their several departments, and their personal recollections, including Mr. T. S. Goldsworthy, the senior officer and sole surviving member of the “old guard,” who played their part in the battles of the Parliamentary Committee-rooms of long ago, whose reminiscences of the days of old have proved particularly useful; to the Earl of Powis for permission to inspect the voluminous papers of the late Earl, whose name was so intimately associated with the early development of railway schemes in Montgomeryshire; to the family of the late Mr. David Howell for similar facilities in regard to his papers; and, for the loan of photographs or assistance of varied sort to Colonel Apperley, Mr. E. D. Nicholson, Park Issa, Oswestry, Mr. W. P. Rowlands and Mr. Edmund Gillart, Machynlleth, Mr. Robert Owen, Broad Street, Welshpool, Mr. J. Harold Thomas, Garth Derwen, Buttington, the Misses Ward, Whittington, Miss Mickleburgh, Oswestry, Mr. E. Shone, Oswestry, the Editor of the “Peterborough Advertiser,” the publishers of the “Great Western Magazine,” and others. The indexing has been compiled by Mr. Kay, Public Librarian, Oswestry, to whom thanks are due for the efficient discharge of a rather irksome duty.